Four witnesses were called Wednesday morning by the Fulton county grand jury to testify in regard to the existence of vice in Atlanta. They were Colonel Thomas B. Felder, who was on the stand but a few minutes Tuesday; A. J. Young, a real estate man; J. E. Skaggs, agent of the Southern Express company, and Police Chief James L. Beavers. Neither of these witnesses would indicate along what lines he was questioned by the grand jury. It is understood, however, that Colonel Felder submitted a supplementary list to the list of alleged disorderly houses furnished Tuesday by Attorney Carl Hutcheson and that he also turned over to the grand jury a number of affidavits relative to houses which are operating in the city without police interference. Colonel Felder is said to have supplied evidence attacking the official integrity and moral character of Detective Chief Newport A. Lanford. Chief Beavers, it is understood, was questioned at length concerning his vice crusades and the general moral condition of the city as he observes it. He was also asked, it is said, about Attorney Hutcheson’s charge that he had failed to make raids upon disorderly houses which had been reported to him. Upon leaving the grand jury room Chief Beavers stated that he could not discuss what had transpired there as he had been requested not to do so, but he admitted that he had been asked whether he thought his recent crusade against vice had bettered conditions in the city and that he had replied that it was his opinion that conditions were much better today than they had ever been before. The chief says he admitted that it was probable that some disorderly houses were operating surreptitiously and that he assured the grand jury that he was diligently endeavoring to obtain evidence against such places and that as fast as he got thme [sic] evidence he made cases against the proprietors and inmates. Messrs. Young and Skaggs are reported to have been interrogated relative to disorderly houses which may have come under their observation or which they may have information about. A number of persons alleged in Attorney Hutcheson’s testimony to be proprietors, managers and frequenters of disorderly houses, were summoned by the grand jury Wednesday, but were not called. At 1:45 p. m. the grand jury adjourned and excused all witnesses until 10 o’clock Thursday morning. It is expected that on Thursday or Friday the grand jury will begin a probe into the alleged dictograph conversations, in which Colonel Felder, Mayor Woodward, C. C. Jones, E. O. Miles, G. C. Febuary, and A. S. Colyar figure. Subpenas have been issued for a number of witnesses to testify in such an investigation. The grand jury has, it is said, yielded to the demands of Colonel Felder and Chief Beavers to make a thorough investigation of the dictograph episode. Colonel Felder charges that the dictograph records were forged and promises to make sensational disclosures when the investigation is begun. He says that attorneys and court officials agree with him that even if the records were true, he had violated no law, and would not be subject to indictment on any count. The city detectives expect the dictograph records to prove that Colonel Felder sought to bribe G. C. Febuary, a clerk in the detective department, to furnish him with affidavits and other papers relating to the Phagan murder case. Foreman Lewis H. Beck states that the vice probe will hardly be completed before Thursday afternoon, and for this reason he said he did not anticipate that the investigation of the dictograph incident could be started on Thursday. This would indicate that the latter investigation will be begun Friday morning. “Well, if we’ve done nothing else we have caused a general house cleaning in Atlanta,” remarked Colonel Thomas B. Felder when he walked into the ante–room of the grand jury chamber Wednesday morning. “I had them out with the city detectives, all right,” responded Colonel Felder. Police Chief James L. Beavers and Detective N. A. Lanford were walking from the ante-room when Colonel Felder arrived, they having been excused until noon by Foreman Lewish H. Beck, of the grand jury. Colonel Felder called to Chief Beavers and began a conversation with him in the presence of a number of newspaper men and court house attaches. “You can publish what I say, if you wish,” announced Colonel Felder. “You are the man doing the publishing, I am not,” answered Chief Beavers. This closed the conversation and a moment later Chief Beavers left the room. Colonel Felder announced to those about him that some time later he would prove that Chief Lanford is corrupt. “I will also show that those alleged dictograph records were forged,” he said. Colonel Felder referred to Stenographer George M. Gentry’s affidavit attesting the accuracy of the dictograph records and intimated that he had obtained an affidavit from Gentry which contained startling disclosures. Colonel Felder declares that attorneys and court officials have assured him that, even if everything contained in the alleged dictographed records was true and proven, he has violated no law and would not be subject to indictment on any count. Detective Chief Lanford made a statement Wednesday afternoon replying to Colonel Felder’s charge that his department was corruptly administered. He declared that if there was anything wrong in his department he wanted it shown up. Concerning Colonel Felder’s intimation, that A. S. Colyar had sold out Chief Lanford, declared he didn’t know anything about it; that he was not involved and not interested in whether Colyar sold out or not. While before the grand jury Tuesday Colonel Felder says he urged the grand jury to investigate the alleged dictograph episode, and Wednesday morning he stated that he would continue to urge such an investigation. He intimated that if such an inquiry was instituted he would make sensational allegations against the chief of detectives and possibly several others. Solicitor General Hugh M. Dorsey was before the grand jury for about an hour Wednesday morning, during which it is understood he discussed the vice investigation with the members and also the advisability of a probe into the alleged dictograph incident. Colonel Felder, who was before the grand jury for about fifteen minutes Tuesday, was the first witness called Wednesday morning. He was sent for immediately following the conference with the solicitor. 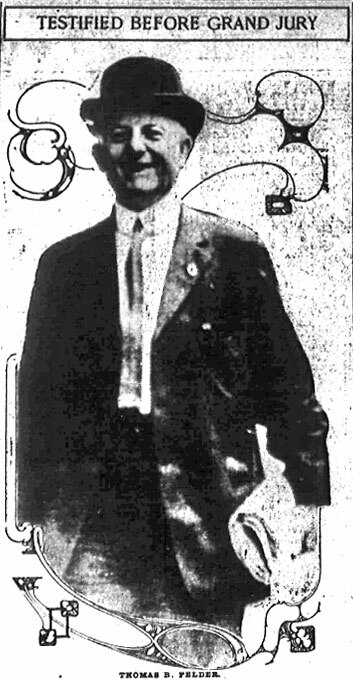 The central figure of the vice crusade, Police Chief James L. Beavers, was among the several witnesses who were about the court house when the session opened. Chief Beavers, who, since the board of police commissioners again has given him full authority, has put his famous vice squad of twenty-two plain clothes men back in harness, declared that he could not understand the attitude of some of the witnesses who have appeared before the probers. Chief Beavers declared that he is now particularly anxious to get Attorney Carl Hutcheson’s promised list of thirty houses with evidence against the owners. Mr. Hutcheson stated on leaving the grand jury room Tuesday that he had furnished the probers with the names of about thirty places, hotels and small houses where vice flourishes, he says, and that in many instances he gave the grand jury sufficient evidence to warrant indictments. There is much speculation over the probable action of the grand jury in the matter. The question is, Will the grand jury return indictments on the testimony given before it, or will the grand jury simply formulate a report on vice conditions to be embodied in is presentments to the superior court, when it is discharged during the first week in July? Owing to a remark made to reporters by Foreman Lewis H. Beck soon after the vice probe was inaugurated, it is inferred that the latter course is probable. Mr. Beck stated that the jury was making a general, not specific, investigation into vice conditions in Atlanta and in making this probe he declared that the jury was sitting like a committee of the whole. The jury especially was charged by Judge W. D. Ellis to make an investigation of vice conditions, and this adds weight to the theory that the jury will render simply a report of its findings to the court and then leave the matter in the hands of the authorities.